This idea comes from Little Green Notebook Blogspot. Many people have room for a kitchen island, and this would add lots of storage space and work space, but they can't find anything they can afford or anything that would look good in their kitchen. 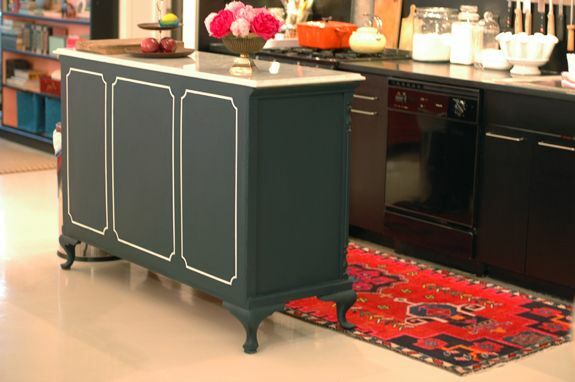 Here is an idea: Find a dresser at a thrift store or yard sale that fits your kitchen style (country, contemporary, traditional, or something else? ), paint it a color you love, and top it with the marble from an old out-of-date coffee table you have also found at a thrift store or yard sale. If you really want to get fancy, add casters to the bottom of the dresser so you can move the island around as you need to. If you can't find an old coffee table with marble, check out the marble or granite tile at the home improvement store and see if you can make that work. With a bit of creativity, you can have a stylish island that adds tons of function to your kitchen without spending a lot of money. Do you have any ideas for thrifty decor? I'd love to hear them!